Snowshoes have come along way from their origins of rawhide netting over a hardwood frame but their purpose remains the same: distribute the weight of the person over a larger area so that their feet do not sink deep into the snow. Snowshoes are most often used on their own but can be used in conjunction with skiing or snowboarding for enabling back country ascents. 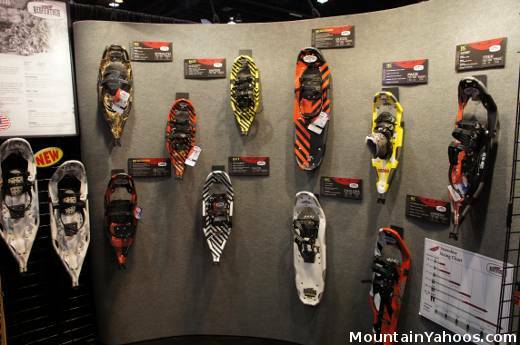 Snowshoe manufacturers are now providing a broad array for racing, off trail flotation in deep snow, mountaineering, narrow steps, kids sizes, etc. wood: this is primarily for decor on the wall of a bar or restaurant or for nostalgic reasons. Aluminum: this is the most popular and is reasonably lightweight and strong. Typically they are powder coated to provide a color coating. titanium: strong as steel with the weight of aluminum. This is often too expensive for no real performance gain. plastic: typically used in children's versions to bring a playful theme or design to the snowshoe. Plastic is generally not durable enough for adults of full weight and strength. rubber: Hypalon is a durable Dupont elastomer used in rubber rafts. This material is tough. composites and plastics: there are a variety of synthetic materials available. eg Coolthane, a polyurethane coated nylon mesh. Crampons: toe or heel and toe variations. durability: materials and construction. Heavier (weight of person and gear) and stronger individuals will require a more durable snowshoe. asymmetrical: These snowshoes typically employ a round nose and pointed tail. Those with a short stride will benefit from an asymmetrical design which helps avoid stepping on the tail of your own snowshoe. Note that an asymmetrical snowshoe has a reduced flotation area in the rear and an area bias to the nose. This imbalance in fore-aft flotation area can lead to less stability. symmetrical: Typically a round nose and tail. 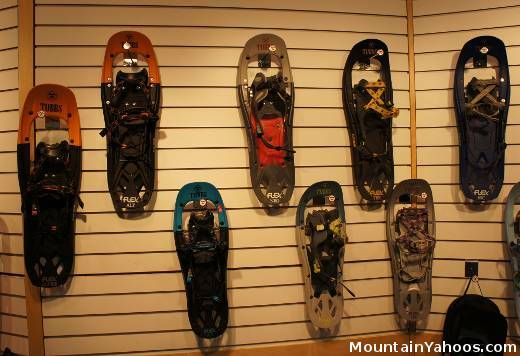 purpose: trail hiking, back-country and racing all lead to different choices in snowshoes. trail hiking: trails tend to be at least slightly packed and thus less flotation is required. back-country: this often leads on to untouched light powder snow into which one will sink if there is not enough flotation. Back-country snowshoes tend to be larger to gain the required flotation. racing: these are typically small and light with an asymmetrical frame to reduce the chance of stepping on one's tail. This typically includes a crampon under the foot for additional traction. A heel lift is sometimes available to optionally lift the heel during ascent. fixed: these provide a natural feeling and predictable behavior. The tail of the snowshoe may flick snow up on your back. pivot: this design has improved incline and descent behavior as it lets the snowshoe lie easily on the terrain surface while the user can maintain a natural foot angle. It can be more difficult to walk backwards with a pivot binding as the tail typically drags and digs into the snow. Faber - articulation like an AT ski. Walk or slide. Ski poles or Trekking poles: Helps maintain balance on the snow. Gaiters: This refers to tall boots often used to wander through shallow rivers and streams. They are also good for deep snow. 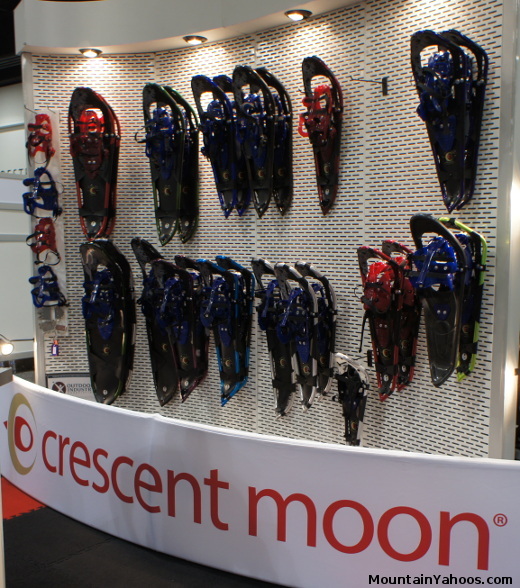 Snowshoeing under a full moon is now quite popular and a beautiful experience. The moonlight reflects off of the snow and lights up the outdoors to generate a beautiful surrounding and of course help you see.